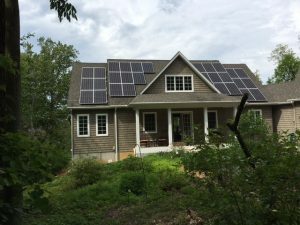 A home sits newly installed with solar. The 21-member (North) and 19-member (South) Dayton Area Solar Co-ops today issued a request for proposals (RFP) from area solar installers. The group members created the co-op to save money and make going solar easier, while building a network of solar supporters. Leppla Associates, McPherson Town, Dayton, The Dayton Beer Company, Mudlick Tap House, the Ohio Environmental Council, and OH SUN are the sponsors for these two co-ops. Local installers interested in serving the group can click to download the Dayton North RFP, Dayton South RFP, and response template. Dayton Area residents interested in joining the co-op can sign up at the Dayton North Solar Co-op and Dayton South Solar Co-op webpages. Joining the co-op is not a commitment to purchase panels. Co-op members will select a single company to complete all of the installations. They will then have the option to purchase panels individually based on the installer’s group rate. By going solar as a group and choosing a single installer, participants get the best value when going solar.